A true albino hummingbird--one that has white feathers and pink eyes, feet, and bill (above)--is extremely rare. Only a few true albino Ruby- throated Hummingbirds (Archilochus colubris) have been reported. 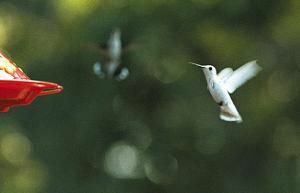 The staff from Hilton Pond Center for Piedmont Natural History captured an albino ruby-throat in Chapel Hill, North Carolina in August 2003, as described on the Center's web site at Banding The Albino Hummingbird. 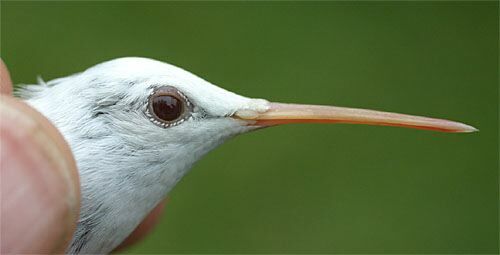 Leucistic hummingbirds are still rare but are seen more often than true albinos. Like "normal" hummingbirds, lecistic forms (see photos above right and below) have black eyes, feet, and bills, but their feathers may be pure white, buffy, tan, or gray instead of green or some other "normal" color. See This Time, It's Leucistic. There are several other pictures of white hummingbirds within the Gallery section of the Web site for Operation RubyThroat. If you encounter a white hummingbird, please document it with a clear photo or video and e-mail it to Hilton Pond Center for Piedmont Natural History via RESEARCH. Be sure to include your name, city/state, date(s) of sighting(s), and any interesting anecdotal info you wish to share. 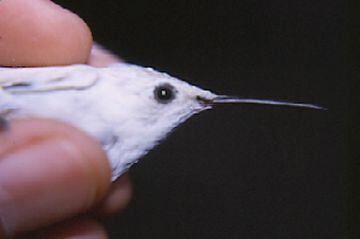 If you report a white hummingbird and someone is able to band it, you may help play an important role in our understanding of how albinism and leucism affect hummingbird populations.